Customer Service, Hinderence Or Help? Google Now - your smartphone personal trainer? Customer service. How important is it to you? for me, its often more important than the actual product. Customer service is the go to place when things cant be solved by a simple Google search. Its my personal opinion that customer service should be simple, straight forward, and solutions to problems should be provided in a timely manner. Promises should be kept and all calls should be logged in detail should a related problem appear somewhere down the line. Most of the above did not happen recently with me, and i find it my duty to make a public complaint in hopes that it will alert the offending company to its problems, so additional training can be provided to its staff. The offending company? T-Mobile UK. Before I begin ranting and raving like a drunk 20p short of another pint, I’d like to make a few things clear. I have been a T-mobile customer for 5 years. The service has always been above expectations. The staff in my local store are always very helpful and willing to chat about just about anything relating to their service. On the few occasions I’ve needed to speak with their customer service team, i have been dealt with swiftly and any problems resolved usually within 5 minutes of the call being answered. I can appreciate calls at different times of the day have different wait times, and cannot recall being on hold for more than 10 minutes. I consider this exceptional service. 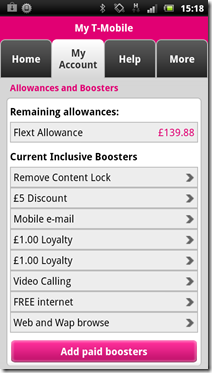 T-mobile have always been great value for money in my opinion, and as such have recommended them to friends, family and followers. A few months ago i noticed my phone contract with T-mobile was due to run out. I knew I could get an upgrade at the time, and with so many phones coming out, i didn’t know what i wanted. So I started looking around to see what was available. Late September i made a call to T-mobile asking what was available. The gentleman i spoke to was quite helpful, and offered to lower my monthly payments until i had decided which phone to get. Fantastic i thought, not spending as much is always handy. This is seemingly where my problems began. Roughly a week after this, i had decided to get the Samsung galaxy S3 LTE, as it was smaller then the Note 2, but still had the same 2GB RAM. I called T-mobile upgrades, and had an automated message saying i was eligible for upgrade in 2014… that’s odd, i thought i was due for upgrade right now. Oh well, they’re probably upgrading their system for the launch of EE later in the month, system bugs can appear. So i called customer services and asked about an upgrade. Certainly sir, I’ll put you through right now, there’s a bit of a queue so you could be on hold for up to 10 minutes. No problem, the call was answered in about a minute. I asked about the galaxy s3 LTE, and was informed it was in stock and would cost £49 for the handset at £36/month on the Full Monty plan. That’s great i thought, but that’s the same as a new customer, I’ve always had things a little cheaper as an upgrading customer, oh well, its a new phone, that sounds reasonable to me, when can i expect to receive the phone? I was informed i would receive the phone in 3-5 days. Fantastic. A full week later, no sign of the handset. a quick call to T-mobile customer services revealed it hadn’t been dispatched yet, but no reason why. The representative placed me on hold in search of an answer. It seems they were out of stock, but the upgrade department had a few left and it should be sent to me swiftly, another week goes by and still no sign of a phone, again i call customer services and told there was no stock. Surely a company the size of T-Mobile would be able to get stock of a phone within 2 weeks of placing an order. I was promised a call back with an update on what was taking so long. A full 24 hours later and no call back. I spoke with my local T-Mobile store to see if they could help in any way, but they informed me they had no control over orders placed on the phone or online, and that they had been informed to not sell any 4G LTE handsets until EE launched. I decided to call T-Mobile again to check what was happening. I was on hold for a while before somebody answered, and they were unsure of my enquiry, so placed me on hold while they checked with a colleague on how to handle my call. Roughly 20 minutes later i was unknowingly passed onto a different department and had to explain my situation again. He was unable to help and passed me onto another department. Having to wait on hold again was beginning to stress me out. T-Mobile’s playlist for people on hold is depressing to say the least. 45 minutes into the call i was speaking to a third representative explaining the situation yet again. By this time i was ready to start shouting, but as i was speaking to a lady, i remained calm and polite. I was informed sometimes orders can take 7 days to process, plus the delivery time of 3-5 days, but i should still have received the phone by now. She too was unable to help me, and promised a call back after 1PM Wednesday with an update. I explained to her that i had been promised return calls before and not received them. She apologised on their behalf and continued to promise a call after 1pm as she didn’t start work till 12. At this point i had been in the call for 53 minutes and not yet had an answer to what was going on with my order. 1PM Wednesday came and went, as did 2,3,4,5,6,7,8,9 and 10, all without a call from T-Mobile. Another broken promise, yet again. It was looking like my 3-5 day delivery was going to be 3-5 weeks. It was now Thursday morning and i had enough of all this mucking about. I called T-Mobile to cancel my order, and cancel my subscription to their service. It was then i discovered i had agreed to a 24 month deal in late September, the week before i ordered the handset for my update. I don’t recall any mention of 24 months in the conversation i had previously at all. I was outraged and immediately started a list of problems i had over the previous weeks, the person had to stop me a few times so she could catch up with the notes i was making as she was filing a complaint on my behalf. 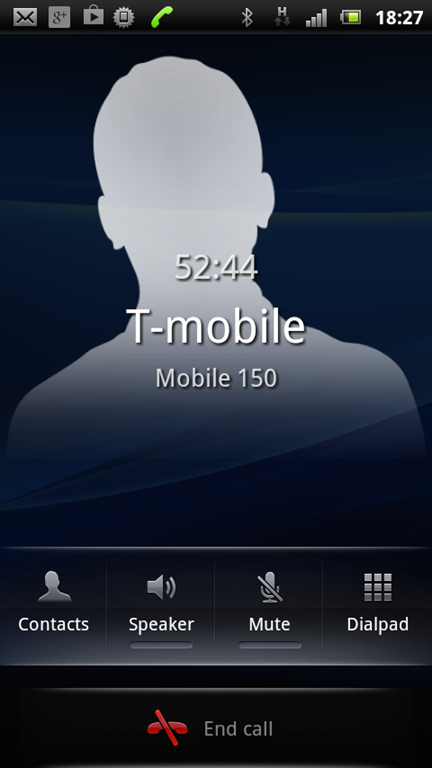 She ended the call saying "i really hope we can keep you as a T-mobile customer"…. there’s some serious sucking up to do for that. I was also informed that as i had cancelled my phone order, i would return to my previous package, now this is not the case. 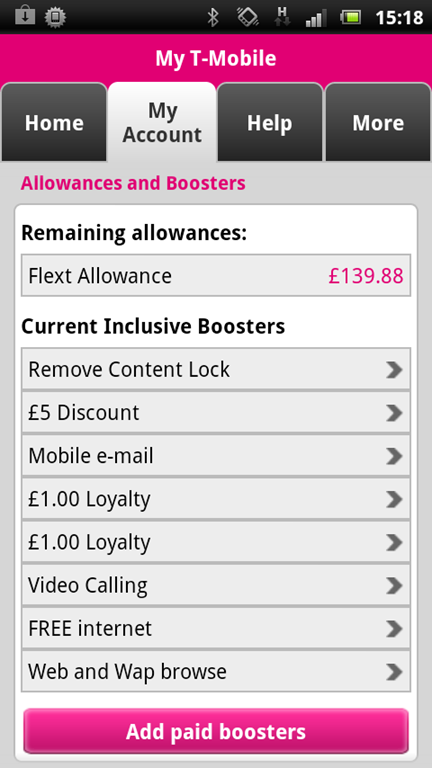 Prior to making my initial call asking about available offers, i had 2 £1 loyalty discounts showing in my account. After that call, i had the 2 £1 loyalty discounts, and a £5 discount. If things were returned to their previous state, then surely they would show in my account online. Neither the loyalty discounts or the £5 discount are showing, so I’m assuming I’m not getting them. So now here i am, 5 days after making the complaint waiting or a return call from the complaints department. I was informed it would take around 5 working days, so have to wait till Thursday before i find out what will happen. As far as i am concerned, it was not made clear that accepting the discount was a 24 month agreement, and i believe i have been miss-sold a service. T-mobile, if you’re reading, please take note. This is not satisfactory customer service. 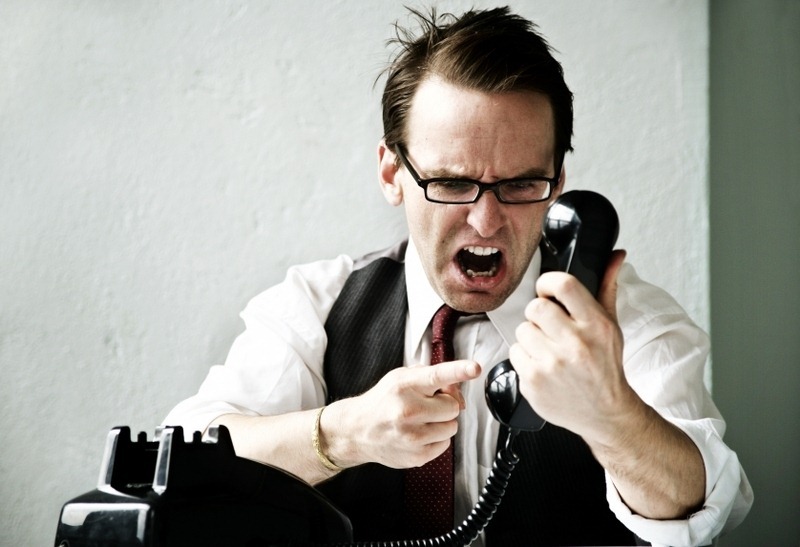 Nobody should be in a call for 53 minutes and not have their problem resolved, ever. When your representatives promise a call back, make sure they do. When your representatives say 3-5 days delivery, make it your personal responsibility to make it happen. When your representatives say you have something in stock, make sure they can clearly see the available stock and current outstanding orders. in one call i was informed the stock level was showing as MINUS one. Surely if stock levels show as negative, somebody would go to the warehouse and physically count remaining totals. Negative stock should never be possible. Another thing I’d like to see is a more clear phone menu. Following the instructions to leave t-mobile you’re informed to press option 2 to upgrade or leave, press 2 again to leave, press 0 to confirm, then press 1 to join t-mobile with a Pac code or 2 to leave…. if i wanted to join T-mobile i wouldn’t follow directions to LEAVE! and finally to end the complaint with a seemingly comic note, get some less depressing music if you intend to leave people on hold for long periods of time. Update: after speaking with T-mobile again, I’ve been offered the opportunity to leave T-mobile after the usual 30 days notice required for ending any contract. Needless to say I took the offer and promptly went to visit a Three store. 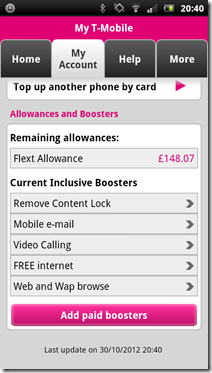 I was offered a Galaxy note 2 for £36/month with an up front cost of £69… half what T-mobile wanted for a similar priced tariff. 30 days can’t come soon enough, and the Three twitter team has already proved more efficient at customer service by personally replying to tweets in around 10 minutes… T-mobile took a day or more. 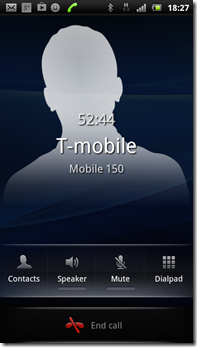 So T-mobile, like the second song in your "on hold" playlist says… if you think I’m coming back, don’t hold your breath.